Can you tell that I'm still holding on to summer? Yep, I'm still talking about peaches. (I might possibly be the only food blogger on the planet that is not writing about that other type of orangey produce that begins with "p.") Vive le seasonality! I'm not having a difficult time holding on to it either because we've had a return to (or rather no respite from) the hot, humid, dog days of summer here in Kentucky. Lots of 90-degree days, which makes me continue to crave cold salads, tomato sandwiches and summer fruit. Ah, summer fruit. Ripe berries, juicy stone fruits -- I can't get enough. I picked up a bag of peaches from my local farmers last week and they told me they were the very last ones of the season. Gah! The last ones! I turned a good number of them into a gorgeous peach puree (it's dynamite as a substitute for applesauce in my homemade granola) but still had a couple left for these peach cake muffins. I'm calling them peach cake muffins because they taste like and have the consistency of a buttery peach cake but -- surprise! -- are healthier, with very little sugar and butter and soymilk in place of dairy milk. Their not-too-sweet taste is perfect for letting the juicy ripeness of the peaches shine through. 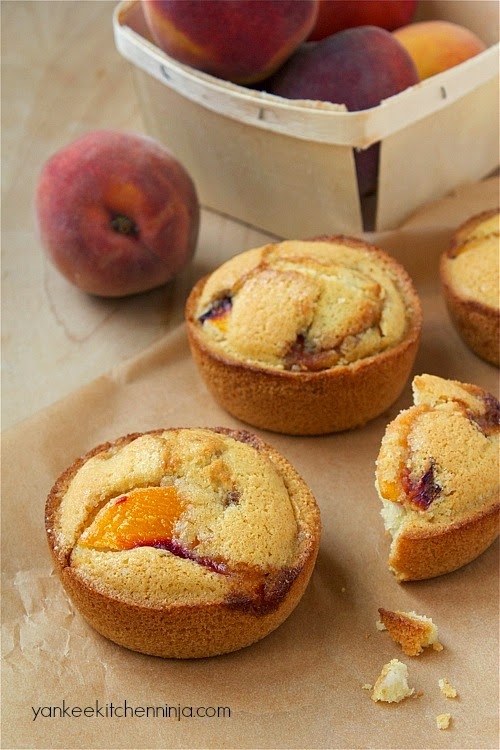 And, because the peaches sink into the muffin from the top, the muffins retain their cakiness and never get soggy. Make them in cake form instead by pouring the batter into an 8-inch round cake pan and baking it for just a few minutes longer than the muffins. In cake form, serve them for dessert with some vanilla ice cream. Use white whole wheat flour for extra fiber if you don't need to eat gluten-free. No peaches? Substitute another stone fruit (plums would great) or some thin apple slices. How's the transition from summer to fall where you live? Are you eating crisp apples in cozy sweaters or are you slowly sweating your way into fall like The Ninj? Do tell. In a small bowl, whisk together the first four ingredients (the dry) and set aside. With a mixer, cream together the butter and sugar until light and fluffy. Beat in the egg and vanilla. Add the dry mixture to the wet mixture, alternating with the soymilk, beginning and ending with the dry mixture, mixing just until combined in between each addition. Spoon the batter into prepared muffin tins. 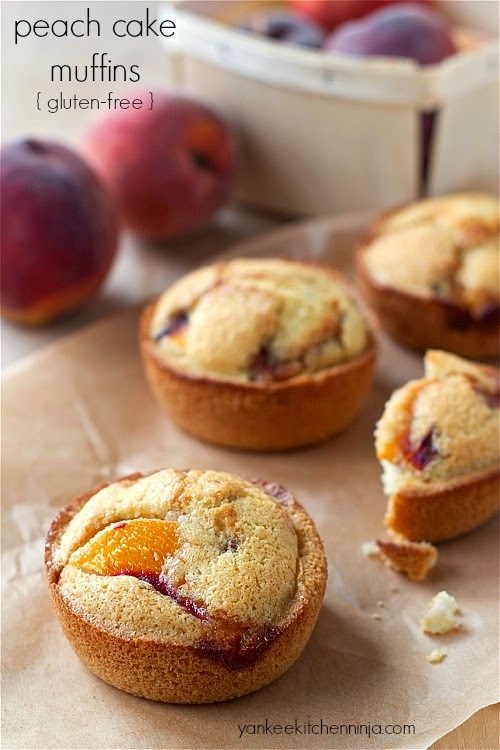 Top each with 2-3 slices of peach and sprinkle with coarse sugar. Bake for about 20 minutes or until muffins are lightly golden and a toothpick inserted in the center comes out clean. Cool completely on a wire rack. These sound really yummy, I love the idea of making it into a cake. Or even serving the muffins as dessert, I'll have to give it a try. And remember, you can make it non-GF if you need to! oh how i wish one of those was sitting next to my coffee mug right now! These sound amazing Ninj! Love that you are still holding on strong to peaches!